Sales pipeline. Sales funnel. Marketing and sales pipeline. Buyers journey. Where does one end and another begin? How are they different? With all the terminology, it’s no surprise that there’s a lot of confusion around the differences and uses of these essential terms. Let’s break it down. Sales pipelines—often explained as the buyer’s steps from lead to customer—are actually the labels your marketing and sales organizations use to categorize the sequence of activities and outcomes expected as they pursue a sale and interact with buyers. The problem? These stages, from the naming of them to implementation usually don’t consider the buyer’s point of view. By definition, it’s the perspective of your organization about a prospect as they move the buyers through your sales process. Does your prospect ever consider themselves in the “lead generation” stage? Unlikely. What’s more likely is that your prospect has an idea, problem or something they want to learn. In a buyers journey this might be called the Awareness, Inspiration or Learning stage. Is a buyer’s journey enough? No. In order to create a buyer-centric experience, you do need to orient and familiarize your marketers and sales reps with how buyers are thinking, but this needs to be in the context of their jobs or they aren’t going to pay attention. This is where the revenue journey comes in. 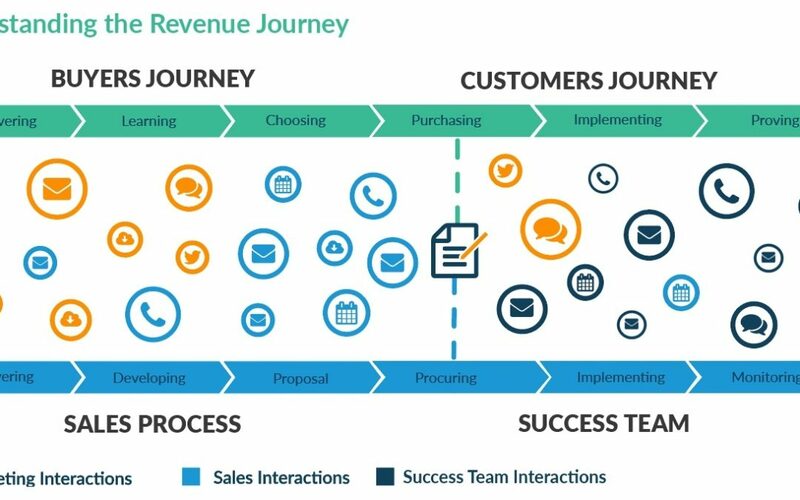 Simply put, the revenue journey visually combines the buyers journey with your sales steps in order bring context to the process. Here’s a sample representation. Notice how marketing and sales can both be communicating with buyers at the same point in the journey? Considering that 68% of companies struggle with lead generation, there’s a lot of room for improvement. Creating campaigns that are targeted to buyers divided up into similar segments based on their role, preferences and needs helps marketers to send messages that resonate better with their audience. The fact that Forrester found that expertise in lead nurturing results in a 50% increase in sales-ready leads is disturbing. To make this assessment possible, consider how many marketers are delivering content and messaging to potential buyers without a framework of based on expertise? Hire marketers with expertise—and mentor the ones who need more—in order to make sure that they are providing exceptional experiences to buyers. Research shows that 79% of B2B marketers have not established lead scoring, which likely explains the next stat below. When you’re defining how you score leads, you have to take into consideration high value actions like form fills, pricing interest, repeat visits, etc.. Go a step beyond typical metric assessments by considering the point at which your buyer wants to engage with sales. Have they met the needs they prefer to meet before speaking to someone? Do they need pricing to even have the first consensus discussion around solving the problem? Understanding what your buyers need—and when—is critical to building an effective scoring model. Hubspot found that only 8% of salespeople say leads they receive from marketing were very high quality—this is alarming. Sales is likely to feel like they are wasting time when they call “qualified” leads that aren’t ready to engage with sales. Marketers can set up a framework for an Ideal Customer Profile (ICP) to make sure that potential buyers are a fit for sales and then do research against current customers that match their ICP to gain a deep understanding of buyers needs. This perspective will ensure that leads sent to sales genuinely qualified. It’s also been reported that 61% of B2B marketers send all leads directly to Sales; however, only 27% of those leads will be qualified. That’s a lot of rejected leads. Before marketing sends leads to sales, they should evaluate if the lead is really ready to speak with Sales. Build a checklist of buyer needs that require fulfillment prior to sales engagement and a nurturing plan to meet those needs. Nurturing more effectively helps keep buyers interested and sales to stay focused on the buyers that are ready. And with 50% of “qualified” leads not yet being ready to buy, delivering higher quality leads to sales has never been more important. Sales time is expensive and should be focused on leads that are qualified and opportunities that can be closed. Understanding more about where the buyer is on their journey will help marketers deliver sales-ready leads. If you can empower marketing to conduct meaningful buyer research and help sales to see their “leads” from the buyer’s perspective, you’ll be well on your way towards a buyer-centric marketing and sales experience. « Are Your Reps Armed to be Superagents?